Although St-Cirq-Lapopie is jam-packed with tourists during the summer, it's eerily quiet in the winter months. Few people live there year-round and all the shops and restaurants are closed in winter. Except at Christmas! This past weekend was the annual Marche de Noel or Christmas Market at St.Cirq. Many of the shops were open and there were two tents set up in the square by the mairie full of enticing Christmas goodies to buy...jewelry, pottery, candy, baked goods, etc. The biggest draw, however, seemed to be le creche vivante or living creche inside the church. 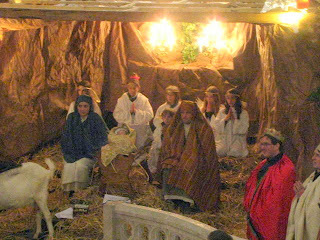 We arrived just in time to catch the Three Kings make their way to the manger up behind the altar. 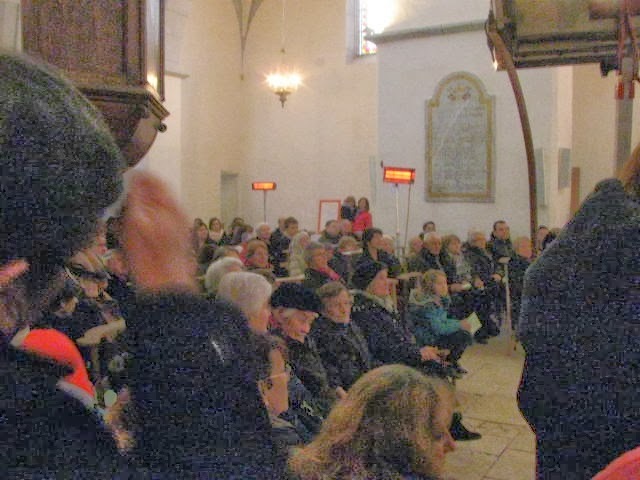 The church was full of rapt visitors who were enthralled with the play-acting and carol singing. Yes, that's a goat hind end you see. There must have been a shortage of local sheep, because a goat had to stand-in with the shepherds. There was a lovely, patient donkey, though. Everyone wanted to pat him after the performance, and he obliged them all. What a sweetheart! 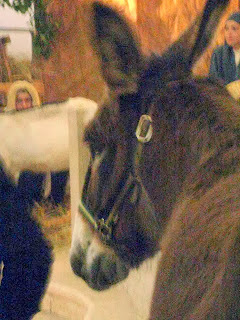 He kept looking at Greg; he must have known that Greg's a donkey lover who was muttering something about sneaking him out the back door and home to Cadrieu. The attentive audience stayed bundled up despite the heat lamps (orange rectangles on stands) placed around the sanctuary. These old stone churches are really cold in the winter. Back to Cajarc for a quick coffee and then a 5 PM concert in the church there...two women, a male guitarist and an 11 year old girl singing Russian folk songs, opera and sacred music. Amazing voices all!